Ancient history has given this star many names. Associated with the mythological figure Perseus, Beta was considered to be the head of Medusa the Gorgon, and was known to the Hebrews as Rosh ha Satan or “Satan’s Head.” Seventeenth century maps labeled Beta as Caput Larvae, or the “Specter’s Head,” but it is from the Arabic culture that the star was formally named. They knew it as Al Ra’s al Ghul, or the “Demon’s Head,” and we now know it as Algol. Because these medieval astronomers and astrologers associated Algol with danger and misfortune, we are led to believe that Beta’s strange visual variable properties had been noted throughout history. Italian astronomer Geminiano Montanari was the first to record that Algol occasionally “faded,” and its regular timing was cataloged in 1782 by John Goodricke, who surmised that it was being partially eclipsed by a dark companion orbiting it. Thus was born the theory of the eclipsing binary, which was proved spectroscopically for Algol in 1889 by H. C. Vogel. 93 light-years away, Algol is the nearest eclipsing binary, and is treasured by the amateur astronomer because it requires no special equipment to easily follow its stages. Normally Beta Persei holds a magnitude of 2.1, but approximately every three days it dims to magnitude 3.4 and gradually brightens again. The entire eclipse only lasts about 10 hours! Although Algol is known to have two additional spectroscopic companions, the true beauty of watching this variable star is not telescopic – but visual. The constellation of Perseus is well placed this month for most observers, and appears like a glittering chain of stars that lie between Cassiopeia and Andromeda. Take a look at Gamma Andromedae (Almach), east of Algol. Almach’s visual brightness is about the same as Algol’s at maximum. Studies by the Hubble telescope have confirmed this, as well as shown a large meteor impact crater which exposed Vesta’s olivine mantle. Debris from Vesta’s collision then set sail away from the parent asteroid. Some of the debris remained within the asteroid belt near Vesta, and became asteroids themselves with the same spectral pyroxene signature. But some of the debris escaped the asteroid belt through the “Kirkwood Gap” created by Jupiter’s gravitational pull. This allowed these small fragments to be kicked into orbits that would eventually bring them “down to Earth.” Did one make it? Of course! In 1960 a piece of Vesta fell to Earth and was recovered in Australia. Thanks to Vesta’s unique properties, the meteorite was definitely identified as coming from our third largest asteroid. 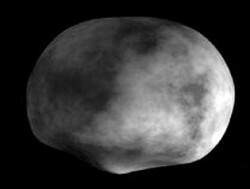 Now, that we’ve learned about Vesta, let’s talk about what we can see from our own backyards. As you can discern from the image, even the Hubble Space Telescope doesn’t give incredible views of this bright asteroid. What we will be able to see in our telescopes and binoculars will closely resemble a roughly magnitude 7 “star.” Tonight you can find Vesta near Alpha Ceti. Vesta will be at opposition in just three days, and is now in retrograde, so you will be able to watch it slowly move away from Alpha Ceti for the rest of the year. Of course, the approximate coordinates given above are only accurate for a short time, so I strongly encourage you to use a good planetarium program to print accurate locator charts, or visit an online resource such as the IAU Minor Planet Center for more details. When you locate the proper stars and the asteroid’s probable location, mark physically on the map Vesta’s position. Keeping the same map, return to the area a night or two later and see how Vesta has moved since your original mark. Since Vesta will stay located in the same area for awhile, your observations need not be on consecutive nights, but once you learn how to observe an asteroid and watch it move – you’ll be back for more! Known as NGC 7293, this faint planetary nebula’s “ring” structure is around half the size of the full Moon. While its total magnitude (6.5) and large size should indicate it would be an easy find, the Helix is anything but easy because of its low surface brightness. Binoculars will show it as a large, round, hazy spot, while small telescopes with good seeing conditions will have a chance to outshine larger ones by using lower power eyepieces to pick up the braided ring structure. As one of the very closest of planetary nebulae, NGC 7393 is very similar in structure to the more famous Ring, M57. It is a spherical shell of gas lighted by an extremely hot, tiny central star that’s only around 2% of our own Sun’s diameter – yet exceeds Sol in surface temperature by over 100,000 Kelvin. Can you resolve it? Best of luck! Located about halfway between Delta and Zeta Draconis is one of the brightest planetary nebulae in the night – 8.8 magnitude NGC 6543. Around three thousand light-years away, it was one of the first planetaries to be studied spectroscopically, and the resulting emission lines proved the phenomenon was actually a shell of gas emitted from a dying star. Our own Sun awaits a similar fate. While a small telescope will never reveal NGC 6543 as gloriously as a Hubble image, you can expect (even in a small telescope or binoculars) to make out a small, blue-green, glowing object. But a large aperture telescope and good sky conditions are needed to reveal some of the braided structure seen within. No matter how you view it, the Cat’s Eye belongs on the list of spooky objects! So far we’ve collected a demon, a pumpkin, a galactic ghost, and the eye of the cat… And what Halloween would be complete without a witch! Easily found from a modestly dark site with the unaided eye, the Pleiades can be spotted well above the northeastern horizon within a couple of hours of nightfall. To average skies, many of the seven bright components will resolve easily without the use of optical aid, but to telescopes and binoculars?… M45 is stunning! First let’s explore a bit of history. The recognition of the Pleiades dates back to antiquity, and its stars are known by many names in many cultures. The Greeks and Romans referred to them as the “Starry Seven,” the “Net of Stars,” “The Seven Virgins,” “The Daughters of Pleione,” and even “The Children of Atlas.” The Egyptians referred to them as “The Stars of Athyr;” the Germans as “Siebengestiren” (the Seven Stars); the Russians as “Baba” after Baba Yaga, the witch who flew through the skies on her fiery broom. The Japanese call them “Subaru;” Norsemen saw them as packs of dogs; and the Tongans as “Matarii” (the Little Eyes). 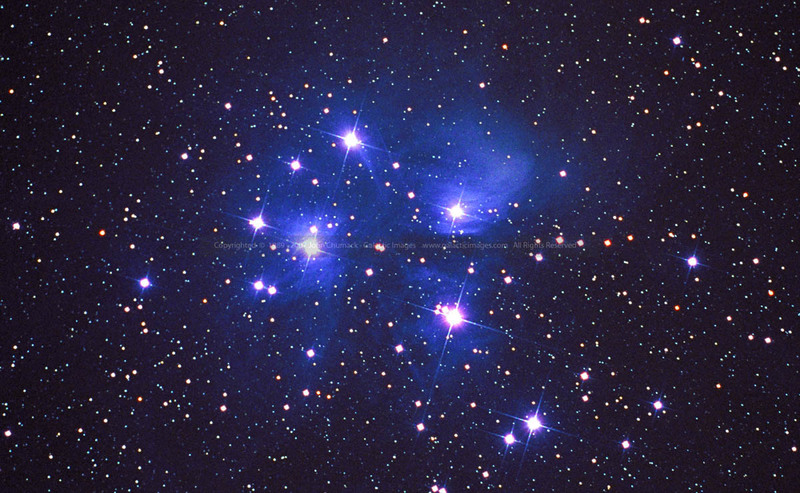 American Indians viewed the Pleiades as seven maidens placed high upon a tower to protect them from the claws of giant bears, and even Tolkien immortalized the star group in The Hobbit as “Remmirath.” The Pleiades were even mentioned in the Bible! So, you see, no matter where we look in our “starry” history, this cluster of seven bright stars has been part of it. But, let’s have some Halloween fun! The date of the Pleiades culmination (its highest point in the sky) has been celebrated throughout its rich history, being marked with various festivals and ancient rites – but there is one particular rite that really fits this occasion! What could be more spooky on this date than to imagine a group of Druids celebrating the Pleiades’ midnight “high” with Black Sabbath? This night of “unholy revelry” is still observed in the modern world as “All Hallow’s Eve,” more commonly called Halloween. Although the actual date of the Pleiades midnight culmination is now on November 21 instead of October 31, why break with tradition? Thanks to its nebulous regions, M45 looks wonderfully like a “ghost” haunting the starry skies. Saturday, November 1, 2008 – On this day in 1977, Charles Kowal made a wild discovery – Chiron. This was the first sighting of one of the multitude of tiny, icy bodies inhabiting the outer reaches of our solar system. Collectively known as Centaurs, they reside in unstable orbits between Jupiter and Neptune and are almost certainly “refugees” from the Kuiper Belt. This evening have a look at the lunar surface and the southeast shoreline of Mare Crisium for Agarum Promontorium. To a small telescope it will look like a bright peninsula extending northward across the dark plain of Crisium’s interior, eventually disappearing beneath the ancient lava flow. Small crater Fahrenheit can be spotted at high power to the west of Agarum, and it is just southeast of there that Luna 24 landed. If you continue south of Agarum along the shoreline of Crisium you will encounter 15 kilometer high Mons Usov. To its west is a gentle rille known as Dorsum Termier – where the remains of the Luna 15 mission lie. Can you spot 23 kilometer wide Shapely further south? Tonight let’s use our eyes, binoculars, or even a telescope at lowest power to have a look at two objects cataloged by Sir William Herschel on this night. You may know them as the “Double Cluster”. Properly designated as NGC 869 and NGC 884, this pair has definitely got to go into history as “How come Messier missed them?” Probably already known in pre-historic times, and first cataloged by Hipparchus (ah! that’s why! ), they are easily seen by the eye as a hazy patch in the Milky Way between Cassiopeia and Andromeda. Located a little more than 7000 light-years away, and a few hundred light-years apart, they are both very young as clusters go – but they differ radically from each other in age: NGC 884 is about 5.6 million years old, while NGC 889 is only 3.2 million. Both clusters are listed on many “Best Objects” lists, so be sure to congratulate yourself for noting them as Caldwell 14! Sunday, November 2, 2008 – Today celebrates the birth of an astronomy legend – Harlow Shapely. Born in 1885, the American-born Shapley paved the way in determining distances to stars, clusters, and the center of our Milky Way galaxy. Among his many achievements, Shapely was also the Harvard College Observatory director for many years. Today in 1917 also represents the night first light was seen through the Mt. Wilson 100″ telescope. Discovered by William Herschel on October 27, 1785, and cataloged by him as H VI.20, this class X globular cluster blew apart scientific thinking in the late 1980s when a study of perimeter globulars showed it to be older than its X-class peers by three billion years – thanks to the color magnitude diagrams of Hertzsprung and Russell. NGC 288 is currently thought to be about 11 billion years old. By identifying both its blue and red branches, it was shown that many of NGC 288’s stars are being stripped away by tidal forces and contributing to the formation of the Milky Way’s halo structure. In 1997, three additional variable stars were discovered in this cluster. At magnitude 8, this small globular is easy for southern observers, but faint for northern ones. If you are using binoculars, be sure to look for the equally bright spiral galaxy NGC 253 to the globular’s north. This week’s awesome images are: Beta Persei: Algol – Credit: Palomar Observatory, courtesy of Caltech, Asteroid Vesta – Credit: NASA, NGC 7293: The Helix Nebula – Credit: R. Jay GaBany, The Andromeda Galaxy – Bill Schoening, Vanessa Harvey/REU program/NOAO/AURA/NSF, NGC 6543: The Cat’s Eye – Credit: Hubble Heritage Team/NASA, M45: The Pleiades – Credit: John Chumack, The “Double Cluster” – Credit: N.A.Sharp/NOAO/AURA/NSF, Lunar image by Greg Konkel, annotated by Tammy Plotner, Harlow Shapely (widely used public image) and NGC 288 – Credit: Palomar Observatory, courtesy of Caltech. Our many, many thanks for the fine illustrations! WOW, I’m going to be busy tonight, thanks! I took some shots of M45 and NGC869 and 884 a couple weeks ago. I still need to stitch them together. I’ve been dyin’ to get a good look at the Cats Eye. I’ll be doing that tonight! pass ’em along, archer! i’m always happy to take a look at your work! while i like hubble images, etc. what i REALLY like is to see what the folks in the field are doing. you know, the only thing i wish about halloween is that they’d set the daggone clocks back a few days earlier. every year the kids come around it’s still light when i get most of them. sure, some of them come back later… but it would be much more fun if we could just do it the first time around! now let’s put on the costumes and go have us some fun! !